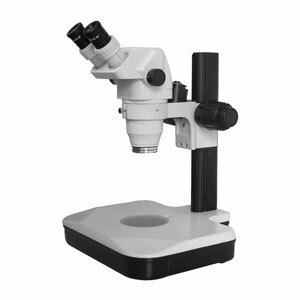 The GS-02200 is a binocular microscope; the GS-02250 is the trinocular version. The third port on the GS-02250 can be used to mount a CCD camera, digital camera, or DSLR for processing micro-image acquisition and storage. Click here to see our camera selection, or use your own camera with our camera adapters. The optional eyepieces, auxiliary lenses, and video coupler makes this model of microscope applicable for a wide variety of applications. It is available bundled with a wide variety of illumination selections.